Last week I looked at the Census ACS median home value compared to the Case-Shiller index and got the relatively poor results I was expecting. This week I'm looking at the Owners' Equivalent Rent measure from the BLS and comparing it to the American Community Survey's Median Contract Rent value. Below is a chart that shows both series expressed as indices set to 100 in 2000. That's pretty good agreement. This is nice to see as I'm using median contract rent values from the ACS in the new housing affordability data I've been working on recently. 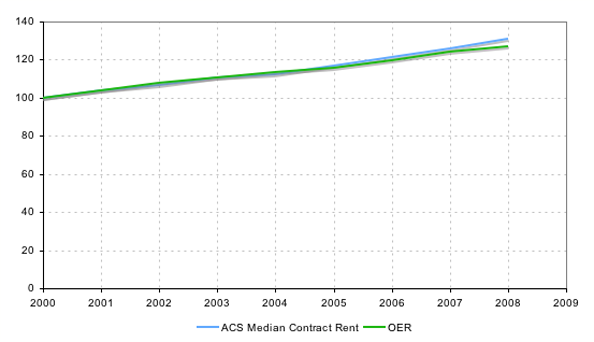 If we can assume that the median contract rent tracks an OER like metric at the state and metro level then we've got a good (albeit short) time series that we can use to measure changes in rent at local geographies since the Census provides the data at multiple levels of geography.